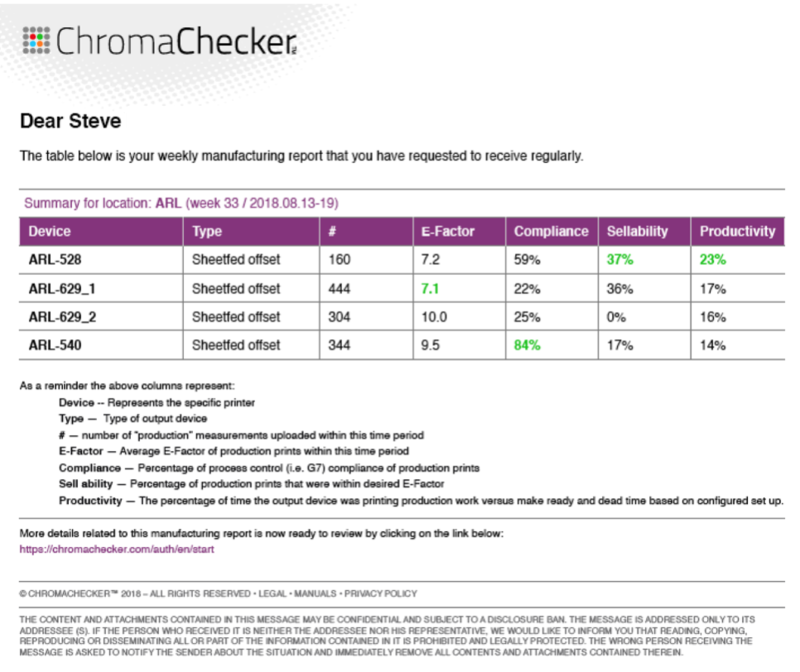 Performance Inspector allows managers to understand how each of their print manufacturing devices is rendering color over the previous week or month. These reports can be emailed automatically and each manager will only get the print reports for the devices that fall under their responsibility. The Performance Inspector reports the percentage of prints that were make ready (waste) versus production (salable) prints; Comply to G7; Are within your Expectation Factor; Productivity of how well the printer was utilized. There is also a direct link to the database which allows the manager to get more detailed information on any printer or operator to learn better what is happening on the device to better improve the performance. Printers can be set up for different locations and different departments, and the managers that will receive the reports are configured within the Accountability inspector and assigned to the given printers so they only receive reports relevant to printers under their responsibilities.